Electric Quilt has just announced the release of the latest version of their iconic software (the first release in over 7 years). This version has an entirely new look and feel which I think you are really going to enjoy learning to use it. I know that you are ready get started. In talking to people in my classes and online, one thing I heard frequently is "I haven't really learned how to use my EQ7 software". Or a variation on the theme -- "I haven't used EQ7 in (insert number) of months (or even years)". or -- "I've tried the software, but it wasn't intuitive". 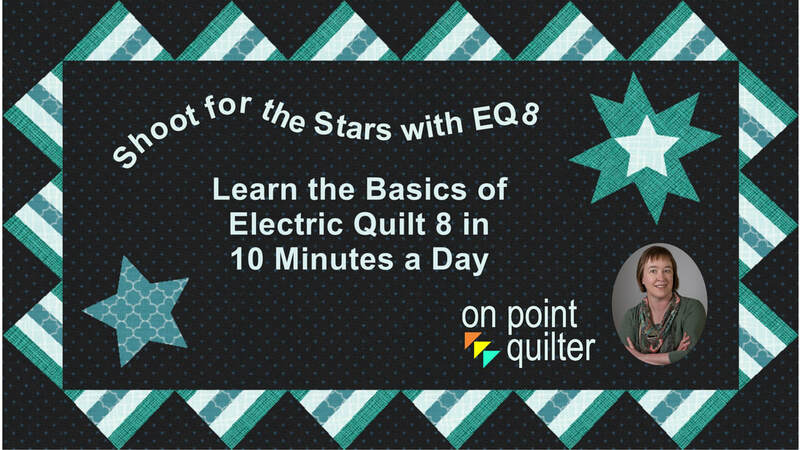 Could you commit to just 10 minutes a day to learn the basics of Electric Quilt 8? What if I offer it to you for only $50? Note: This challenge is designed for both beginners to Electric Quilt and those that have just migrated to Electric Quilt 8. Once you sign up, an e-mail will be sent to your mailbox on Monday, Wednesday and Friday of each week. At the end of the 13 videos you will have designed a a quilt in Electric Quilt 8 and will have been introduced to many of the new features in this release. The theme is Shoot for the Stars with EQ8. The most significant benefit is that you will now be on track to being a regular user of Electric Quilt 8. You will receive an invitation to a private Facebook group. Only people who have purchased the Shoot for the Stars with EQ8 class will have access to this group. In the group you are welcome to post comments, converse with other students about the class and ask questions. What level is this class targeted toward? Newbie/Beginner to Electric Quilt 8. Just install Electric Quilt 8 software on your computer and register it and you are good to participate. Are there any pre-requisites for the class? You should be familiar with your computer or have access to someone that can help with basic computer questions. Does it matter if I am on a MAC versus PC? No Electric Quilt looks essentially the same for both PC and MAC users. Both should be able to successfully complete the project using the instructions in the videos. What if I have EQ7 or EQ Stitch? The challenge and the videos are not targeted for older versions of Electric Quilt. However, if you are thinking of purchasing EQ8 this challenge will assist you in seeing some of the benefits of upgrading. You can also save the emails (with links to the videos) and go through them again once you have purchased EQ8. What if I have EQ Mini? This challenge is not targeted for EQ Mini Users. However, if you are thinking of purchasing EQ8 this challenge will assist you in seeing some of the benefits of upgrading. How will I access the videos? The daily e-mails will contain links to the videos plus any added instructions for completing that day's challenge. What if I didn't receive one of the e-mails? Most of the time these may be located in spam or junk folders. First check there. To minimize the potential issues. add Kari.Schell@onpointquilter.com to your address book. If that doesn't work, please e-mail me so I can help research the problem.